Ask anyone who regularly watched Mr. Rogers’ Neighborhood growing up, and they’ll tell you: Manufacturing videos can be downright mesmerizing. (Remember when he watched the crayon factory? Mind-blowing.) It’s a thesis that’s further proved by this video of Viennetta ice cream cake production that’s been making the rounds on Digg. 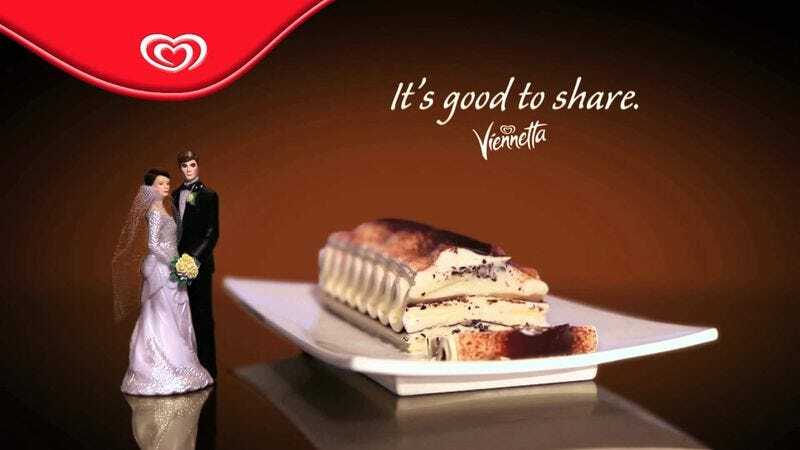 A once-popular Unilever product that’s no longer sold in the United States, Viennetta now mainly thrives in Europe, Australia, and New Zealand, popping up in flavors like chocolate, mint, and pineapple. The clip, above, was filmed at a Chinese factory, and shows the airy delight in production, layer by layer, until it meets up with its frozen brethren and makes its march toward your mouth. It’s nothing shocking—ice cream layer, chocolate layer, ice cream layer, chocolate layer, repeat—but it’s fascinating in a slightly obsessive compulsive way all the same. Plus, it’s basically spring now, so it’s probably time for ice cream or something, right?